Charlottetown, PEI-It wasn’t the prettiest of games but Team QMJHL is happy with the outcome as they knocked off their Russian opponents 3-1 in Game 5 of the CIBC Canada Russia Series. The ‘Q’ had to rely on a strong performance by their net-minder Samuel Harvey (Rouyn-Noranda Huskies) who made 25 saves including a breakaway and several spectacular stops on rebounds. 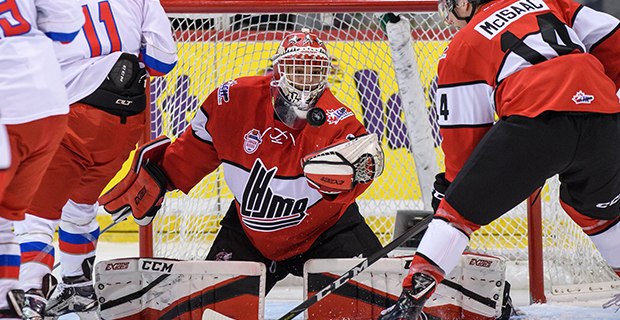 “He (Harvey) had a strong game for sure and made some key saves at the right moments,” said Team QMJHL head coach, Dominique Ducharme who also serves as the bench boss of the Drummondville Voltigeurs. With the victory the CHL took a 9-6 lead in points entering Thursday’s series finale in Moncton. Two of Team QMJHL’s goals were scored on the power play with the other courtesy of an empty net marker. After a sluggish start in which the QMJHL failed to register a shot on goal until midway into the opening period, they took advantage of a power play opportunity to get on the scoreboard. Gatineau Olympiques forward Shawn Boudrias and former Charlottetown Islanders picked up a pass from team captain Peter Abbandonato (Rouyn-Noranda Huskies) in the offensive zone and snapped a quick wrist shot over the shoulder of Russian goalie, Alexey Melnichuck to put his squad up 1-0. The Russians took less than three minutes to reply as they capitalized on a neutral zone turnover to break in 2 on 1 against Harvey. The Huskies goalie made the first save off the stick of Alexey Polodyan but could not stop the rebound which went directly to Andrey Altybarmakyan who made no mistake tying the game 1-1. The second period was all Harvey as he held his team in the game as they were outshot 8-5 in the stanza and 19-11 after 40 minutes. Russia struggles on the power play continued as they failed to put together any pressure during four opportunities through two periods. Team QMJHL jumped all over their third power play of the game at 4:11 of the final frame when Drake Batherson cashed in on a juicy rebound with the go ahead goal. Nicolas Guay (Drummondville Voltigeurs) would add an unassisted empty net goal with 27 seconds remaining to secure a 3-1 victory for Team QMJHL. The Quebec squad have won four straight games dating back to 2015 and will be looking to make it five in a row when the series wraps up on Thursday night in Moncton. Series News & Notes: Tuesday night’s CIBC Canada/Russia Series game marked the first time the event was held in Prince Edward Island. Islanders head coach, Jim Hulton served as an assistant to Dominique Ducharme. Darren Rumble was also behind the bench for Team QMJHL. The Moncton Wildcats bench boss will also serve in the same capacity in Game 6. With the CHL up 9-6 in points, a QMJHL win on Thursday in Moncton would secure a third straight series victory for the Canadian Hockey League. Samuel Harvey and Andrey Altybarmakyan, a Chicago Blackhawks draft pick in 2017 were named the QMJHL and Russian players of the game, respectively.